When they introduced Kickstarter to the public in 2009 I have had my eye on the site. The idea that you could pledge a bit of money for a great idea to hopefully help it come to production is a very exciting one. And despite the controversy aside that people abuse the service or feel they’ve invested in thin air, quite a few great things have come true. I really like the idea that a company can be social and grow excitement about (innovating) ideas and that real products can become popular and successful. In this article I wanted to think about Kickstarter, and pick a project that we can say it’s a success. Not only that, I want the product here, in my own hands and use it. Kickstarter.com is a funding platform for creative projects. 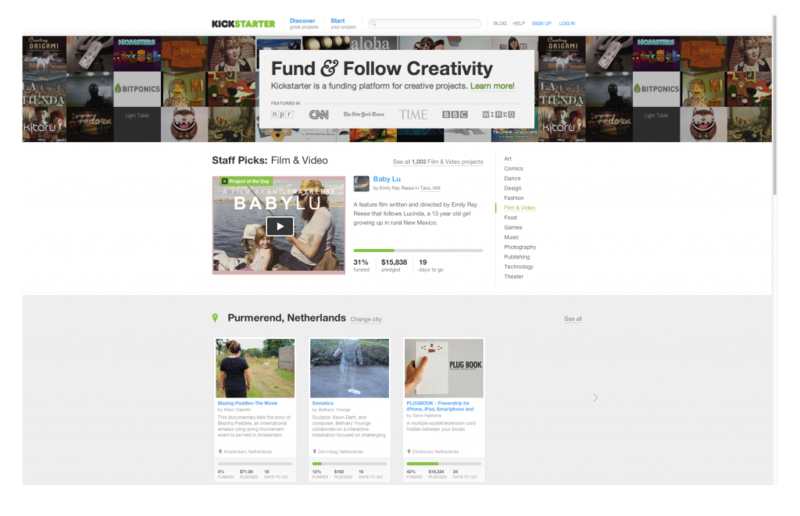 At this very second, thousands of people are checking out projects on Kickstarter. Every project is independently crafted, put to all-or-nothing funding, and supported by friends, fans, and the public in return for rewards. tl;dr It’s cool to see a kickstarter project going from the browser into my hand, and it’s great to finally test a stylus with my iPad. 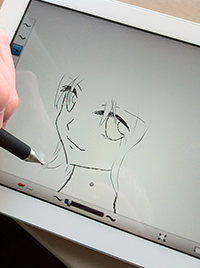 It adds more fun and accuracy to drawing live on a screen. First impression: thumbsup. My personal interest is towards solutions for Apple products, such as the iPad. 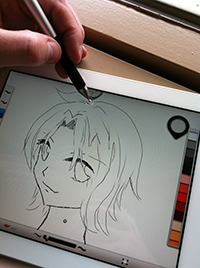 And I feel no need for a stylus for my iPad, except for drawing. 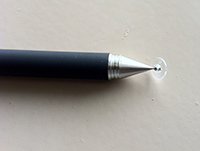 There’s just one thing that has been bugging me when using a stylus: Their tip. Simple as that. The tip is thick, you can’t see where the center is and the top is too wide so there’s too much margin for error. When there was a new project announced that became a bit popular because it wanted to fix these issues, it caught my attention too and I’ve followed their progress. These guys just needed about $2,500 but have raised over $160,000 by nearly 5,000 backers and were able to produce and sell their unique stylus pen and I’ve received it from Mobilefun.co.uk for a review. 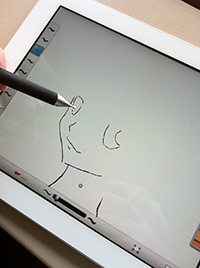 To compare, I’ve browsed through their site for other iPad 3 stylus but I was convinced this one with the transparant top and smaller tip might be the one. 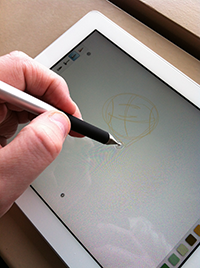 Today it arrived and it’s just a little bit of a weird feeling that a so distant project of a few guys with an idea to improve the iPad stylus has become reality thanks to funding and pledges by people like me and you. And to now have it actually in my hands, up close and personal. This digital revolution is freaking awesome (heart technology). What makes this stylus different than others? 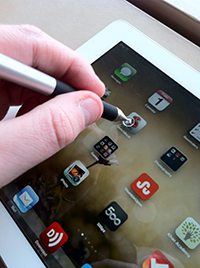 When drawing in apps like Photoshop Touch, SketchBook Pro, Paper, iPhoto, Skitch, or writing in Evernote, Penultimate, etc. You notice quickly enough how thick your fingers are and that you miss precision. But when using a normal stylus you sure do improve on this, however, the tip is thick or it’s a bit unclear where the middle of the pen is. 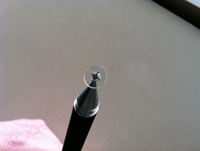 With the Jot Pro it has a transparant tip (circle) which helps you align your strokes with so much more precision. But that’s not all. It is modern, they really thought outside the box and about the user-experience. 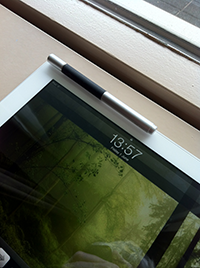 They use the magnets in the iPad so you can stick the pen to the iPad (so no clips to break off anymore). 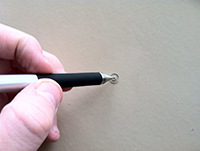 The pen has some weight to it so it feels naturally weighted in your hand, and compliment usage with a rubber strip for better control. And yes, it works on the Magic Track Pad and the MacBook Track Pad, alongside the iPad and iPhone, all generations. 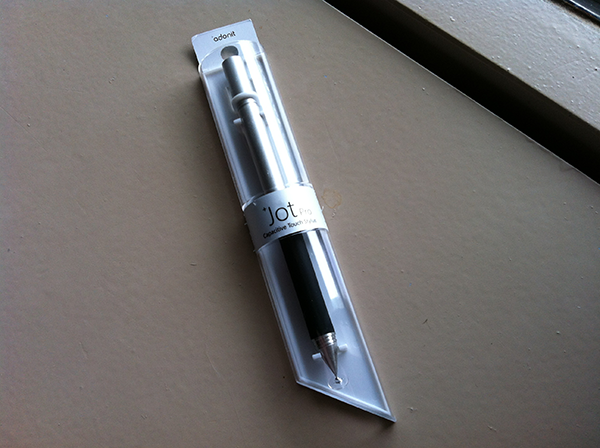 The initial impression is good, the pen feels weighted properly, the tip seems solid and it is easy to get used to. The only thing you have to learn is that you can’t rest your palm anywhere comfortable since it’s a touch interface, and perhaps you want to disable a few accessibility features. It’s great for general usage of any app, navigating through the iOS interface is easy, and certain games are a lot easier as you are more accurate. 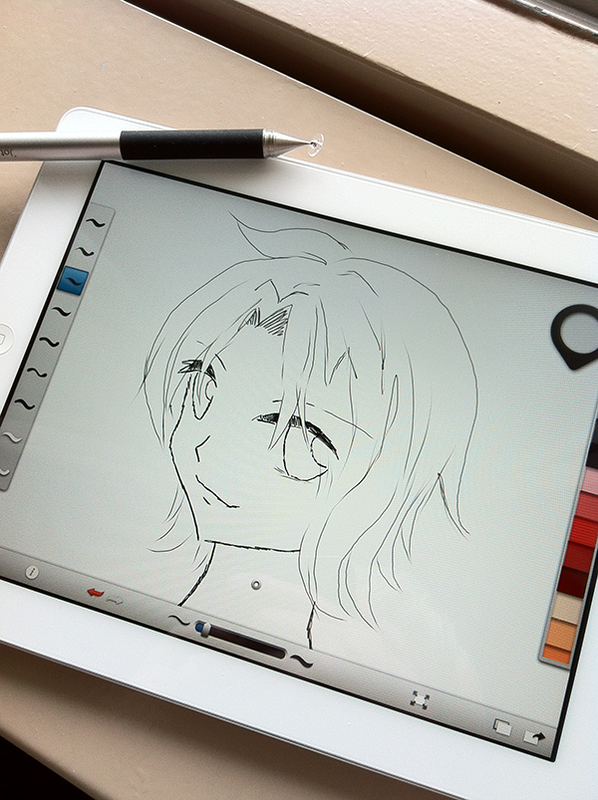 Like I said, I will be using it for drawing the most, so let’s make my first stylus drawing on the iPad. And I apologize for the poor quality. I did not practice, nor did I take the time to get used to the pen. 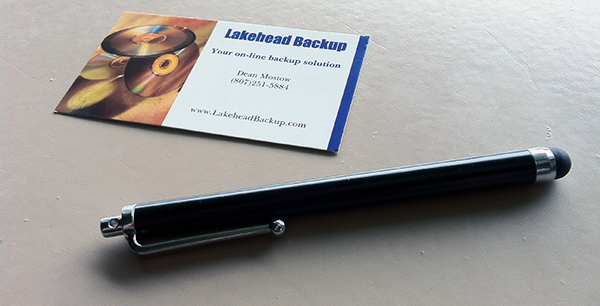 In a way it’s completely different than using a more regular stylus pen such as this one, provided by Dean from LakeHeadBackup.com. Which is great for airbrushing, filling of areas and gaming where you don’t want to get distracted by the ‘ticking’ sound from the Jot Pro every time you tap the screen.